Creamy ice cream in a waffle cup! Very soft for such a fortress! Excellent balance! Custard, honey, milk chocolate, marzipan, cedar, vanilla are the basis of this whisky, which is complemented by mandarin, raspberry, plum, marmalade, apricot jam and corn. And in the background, a lightly toasted bread crust, white pepper and mint! Interesting mole, an unusual combination of tropical fruits, confectionery sweets with mineral-metal, industrial derivatives - a selection for an amateur, but I liked it, something reminded insecticides releases Ben Nevis, only in a lighter and cheerful incarnation, whatever you say, but interesting barrels in SMWS they are able to select. Open, dry, first nose - engine oil with metal shavings, window putty; raisins, sharp notes of sulfur, metal shavings, grindstone; stone dust, margelan radish, drying plaster, sweet shades of tropical fruits, sweet confectionery tones, red orange. Dense, rich, raisins, dried fruits, notes of sulfur, chemical shades, bitter young bark, fruit and berry compote, fruit candied fruits - mango, pineapple, papaya; metallic acidity, ginger. Spicy, warming, raisins, dried fruits, light oily taste - popcorn, sweet pies in deep frying; ginger, orange peel. Like the Arran WB, this is another virgin oak finish, transferred after spending most of it’s life [13 years], in ex-bourbon. F: There’s a horseradish warning, but only if you take it neat - much like the Royal Brackla first up. C: Straight-ahead robust whisky-ish whisky from [yawn], virgin oak. 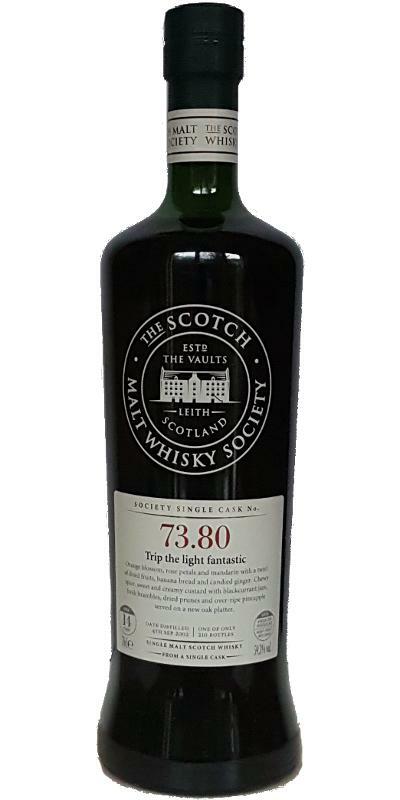 SMWS tasting notes:The aromas danced around the room in delicate steps of orange blossom, rose petals and mandarin before turning to a more autumnal twirl of dried fruits, banana bread and candied ginger. The palate followed with a warming and chewy spice that seemed to envelop the entire body in a comforting blanket of deliciousness. Sweet and creamy custard appeared with sticky homemade blackcurrant jam, fresh brambles, dried prunes and over-ripe pineapple served on a new oak platter. After spending 13 years in an ex-Bourbon hogshead it spent the remainder of its maturation in a Virgin oak hogshead.